One thing we often overlook when moving house is the paperwork involved. Whether renting or buying, there are lot of forms to be completed, information to be provided and paperwork to be dealt with. In this week’s blog, we’re going to take an in-depth look at the admin side of renting a home, the main pieces of information you require and the best way to look after it all. Before we look in depth at the different pieces of paperwork, the first important point to make is this; time spent at the start of the process getting your papers in order and stored correctly is time well spent. Buy a filing box or a concertina-style expanding paper wallet and create a ‘house’ file. If you are an orderly person, you can then file everything in sections relating to different elements of the process, such as finance, references and ID. But, even if – like me – you are one of life’s less organised people, putting all your house related documents into the folder or file, even without sorting them, is still a good idea. It means that all your house-related information is in one place, even if you have to look through everything every time you need something. This is still preferable to having things all around the house in envelopes, waiting to be lost! So let’s imagine that you’ve got your nice ‘household’ folder and everything is nicely filed away in relevant sections (or not!). 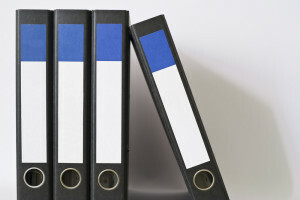 What are the actual documents in the file and why do you need them? One of the most important things you will need when moving between rented properties is references. These can come in many formats and you may be asked to provide copies of references yourself, or to provide contact details so that your new landlord or their agent can request them. If you have written references from previous landlords, make a few copies so that you have a copy immediately available if required. It’s also a good idea to have copies of your most recent bank statements to hand to prove your financial position if required. You will also be required to prove that you are who you say you are. This will usually require you to produce one of the following: a passport, driving license or birth certificate. If you have your own contents insurance, you will need to update your insurance company of your new address and provide details of any changes to your belongings. If applicable, you will also need to inform your vehicle insurers of your change of address. This details the agreement between you and your landlord and will give you details of the amount of notice you have to give and the format the notice should take, together with any other specific details relating to the tenancy. It is important that you have a copy of this in the event of any disputes about the tenancy or with your landlord. This document will have been created when you moved into your current property, detailing the contents and their condition. A leaving inspection will be carried out before you move out with, the original inventory being used as a checklist. Any loss or damage to the property could result in you losing your deposit so it’s important that you have a copy of the inventory available to enable you to query any points. It’s important to have up to date contact details for the person who you would speak to about any issues with the property – this may be your landlord or their appointed agent. Finally, it’s a good idea to store copies of all this information somewhere safe and off the property, in case of an event such as a fire or flood that could destroy your paper records. Put copies on a memory stick and leave it with a trusted friend of family member, or send them to yourself via email. Hopefully you’ll never need to use it, but if you do, you’ll be grateful that you took the time to do it.